Can Your Dog Really Help You Lose Weight? 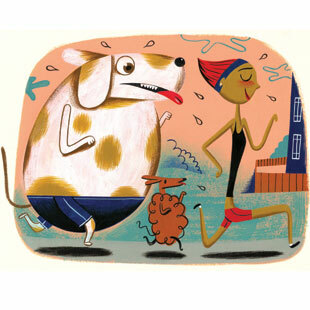 By: Cheryl Sternman Rule | March/April 2007 | Dog-Gone Those Pounds! Your pup may be the perfect partner in weight loss. Just as Americans have become increasingly overweight, so too have their pooches packed on pounds: roughly 40 percent of dogs in the U.S. now are considered overweight. So when Topeka-based Hill’s Pet Nutrition (a pet-food company) contacted Robert F. Kushner, M.D., obesity expert and professor of medicine at Northwestern Memorial Hospital in Chicago, to brainstorm ways to address the pet and people obesity epidemics simultaneously, he was intrigued. “The cause of pet obesity is the same as human obesity: overeating plus under-exertion,” says Kushner. But there’s one difference, he says: “People cause pets’ obesity.” Ignoring portion sizes, offering copious treats and skimping on dog walks all contribute to pets’ added girth. Research shows that when people embark on weight-loss programs with supportive friends, they do better. Would it matter if the friends happened to be furry and walk on four legs? Kushner wondered. Turned out, the dog owners didn’t lose more weight than their “petless” peers. They did, however, say that the dogs made exercise more enjoyable. Seeing their pets slim down also inspired them to stick with their own healthy habits. Bottom line: “If you don’t have someone to walk with, get a dog,” says Kushner, the proud owner of Cooper, a spotted Havanese. Or borrow one: walk an elderly neighbor’s pet or exercise rescued dogs at a shelter.